The 5-year drought has caused the deaths of more than 100 million trees—mostly in the central and southern Sierra Nevada (https://www.usda.gov/wps/portal/usda/usdahome?contentid=2016/11/0246.xml). Row crop acreage in California declined from 4.27 million acres in 2010-12 to 3.23 million acres from 2014-16 (USDA-NASS). Economic impacts of the California drought are difficult to estimate, but researchers at the University of California estimate that the drought in 2016 alone resulted in resulted in $247 million loss of farm-gate revenues, and 1,815 full and part time jobs. When spillover effects to other parts of the economy are considered, total impacts are estimated to be 4,700 full and part time jobs and $600 million in sector output losses. Those costs were likely higher in 2014 and 2015 due to more severe drought conditions. Data from the California Department of Water Resources indicates the snow that fell across the Sierra Nevada in January alone contained an average of two feet of liquid—more than 80 percent of the normal seasonal total (see figure below). Adding snow that accumulated from October-December 2016 and during the first three weeks of February, the Sierra Nevada is ensured of an above-average snowpack for the first time in six years when the traditional peak snowpack date arrives on April 1. 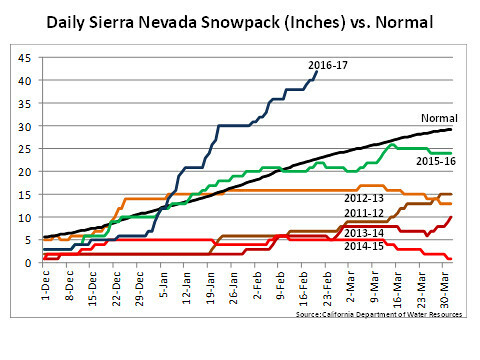 Daily Sierra Nevada Snowpack (Inches) vs. Normal chart. While most decisions about water allocations are made at the state level, the abundance of precipitation during California’s wet season; the promise of abundant, snowmelt-driven spring and summer runoff; and an already dramatic increase in statewide reservoir storage all bode well for a general easing of water restrictions in the wake of the five-year drought and for agriculture in general, the largest user of California’s stored water. California is the most productive agricultural state in the nation, with more than $47 billion in cash receipts and $14.5 billion in net farm income in 2015. It largest sectors include dairy (sales of about $6.3 billion), almonds (sales of more than $5.3 billion), and grapes (sales of nearly $5 billion). Crop insurance indemnities for California crops doubled in 2014 to about $380 million and nearly doubled again in 2015 to $622 million before falling back to $250 million in 2016. Pre-drought indemnities typically averaged around $115 million in the ten year period 2004-2013.